Lunette Cup Wipes are a product from the maker of the popular Lunette Cup designed for people who are on the road and using public restrooms. The easiest way to clean a menstrual cup is in a private bathroom with a sink. In this case, you’d simply take out the menstrual cup, dump the fluid into a sink or toilet and then wash it with soap and hot water. Or, you could use a special menstrual cup cleaning solution such as the Diva Wash. However, if you’re not in a private bathroom, cleaning a menstrual cup after emptying it becomes much harder. Many people take it out, empty it into the toilet, wipe if off with some tissue and then reinsert it. However, this option isn’t especially sanitary. It is fine to do this for a day however because you can go home at night and wash it thoroughly with clean water then. The last, and least favourite situation is if you’re away from home for a few days and don’t have access to clean water at any point in time. This would be the case if you’re camping or traveling in the developing world perhaps. In this situation, something like the Lunette Cup Wipes make a great option. They’ll help keep your menstrual cup clean and sanitary, minus all the hassle. Interested in the Lunette Menstrual Cup? Check out these 10 Facts about the Lunette Cup. 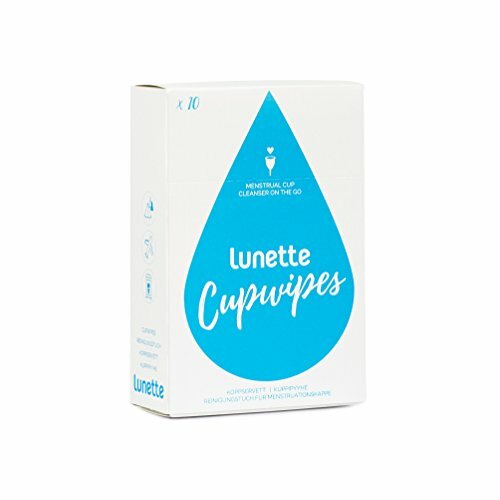 Lunette Cup Wipes are a great option for those that have to clean their menstrual cup in public bathrooms, or for those who are backpacking or traveling to underdeveloped countries. You are able to keep your menstrual cup clean and sterilized without the use of water. They are also biodegradable and compostable so you don’t have to worry about harming the environment by using them. Almost everyone who’ve used them are very happy with them, except that they comment on the expensive price for what you’re actually getting. The main negative about Lunette Cup is the price. However, if you’re on the go a lot and can’t always get to a private bathroom, these wipes are a nice option and certainly better than using toilet paper from a public bathroom, or, not cleaning your cup all before reinserting it. What are your thoughts about these wipes? Leave a comment below and let us know what you think. Also be sure to give this article a share on Facebook, Pinterest, or Twitter. Menstrual Cups wipes are kind of expensive, and I always have the debate inside my head about whether or not they’re worth it. Maybe the only time I’d go for them over just toilet paper would be if I was camping or something like that.